Being from Northern Ireland March 17th is a big deal here. There are parades in Belfast and people get to spend the day with their families. Today the weather was beautiful so my husband and I took our daughters outside to play in the back garden and then had a picnic lunch. Poppy said “it was the best lunch ever because you get to be outside while you eat”. 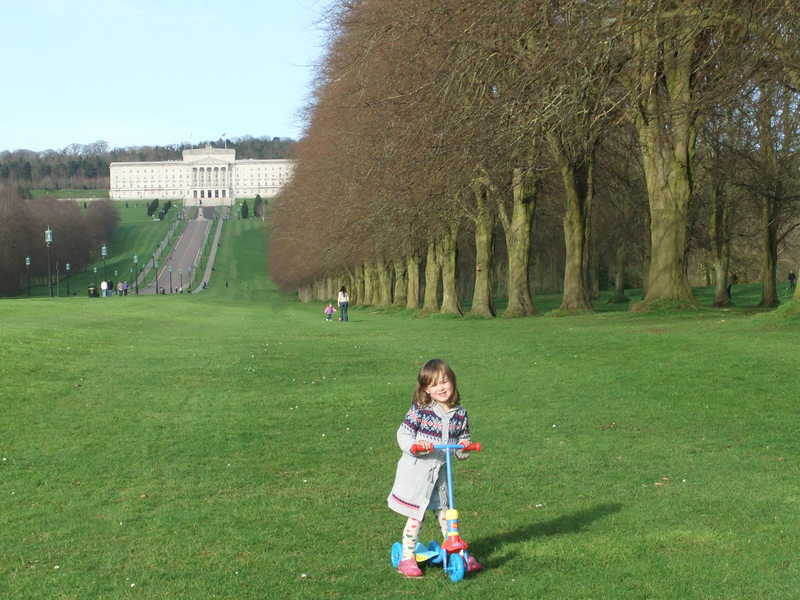 After a while hubby and Elsie had an afternoon nap I took Poppy to Stormont Estate so she could play in the play park and have a good run around. The park was absolutely bunged with families and after Poppy fell off her scooter, trying to avoid someone who walked in front of her, I decided that we would take a walk through the woods into the main parkland. As you can see in the photo the grounds are enormous and they are a really great place to walk. The area is very popular with dog walkers and runners especially as it has a long drive up hill that will give you a great workout (if you’re fit enough to run it). As tomorrow is Mothers Day (in the UK) I hope all the mothers out there have a great day and that you’re spoilt by your kids. I found this pattern to be the hardest out of all the squares I’ve made so far. The yellow wool are rings of popcorn stitches which when made are really dense. A popcorn is a cluster of 4 tr stitches which are made in the same place and then folded and closed at the top by pulling the last tr stitch back to before the 1st tr stitch. 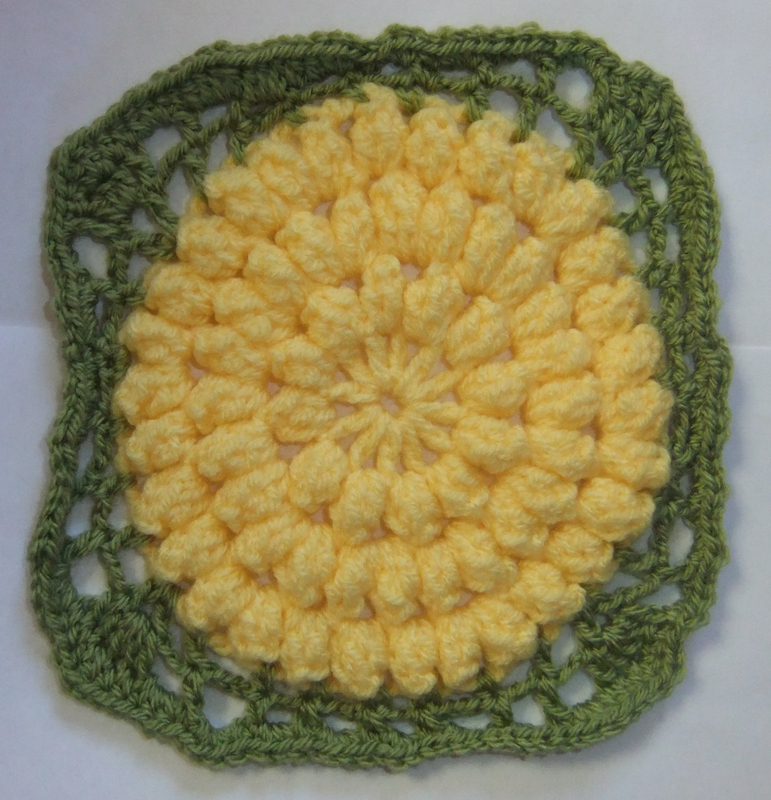 One blog I’m following is Crochet with Tamara and she made a beautiful baby Dahlia throw (which made me want to try the dahlia stitch). 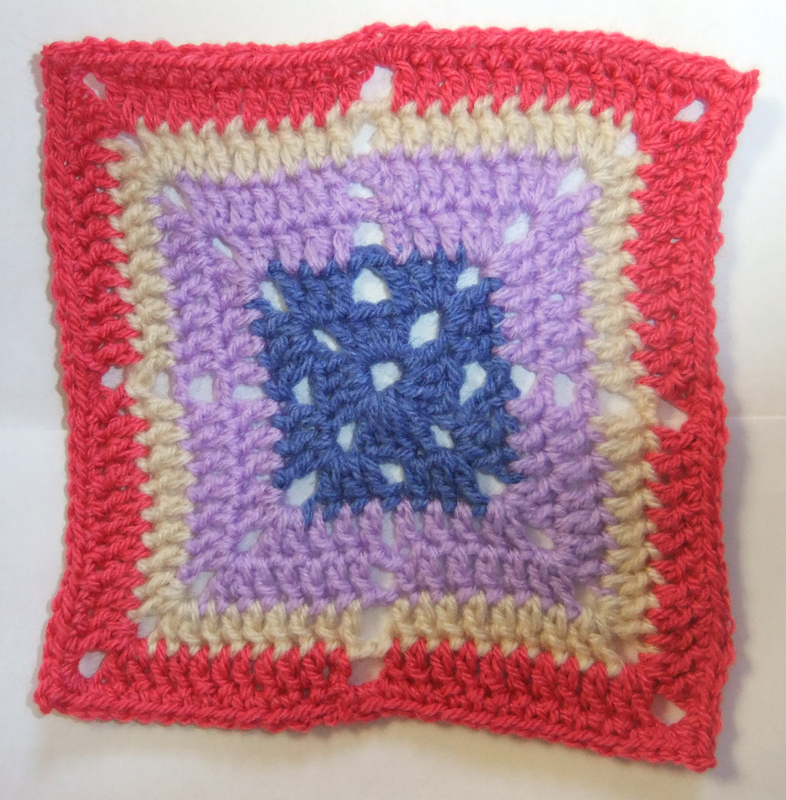 I congratulate her for accomplishing such a well made blanket as I found it difficult making just one square, especially making the border to turn the round dahlia in to a square shape. 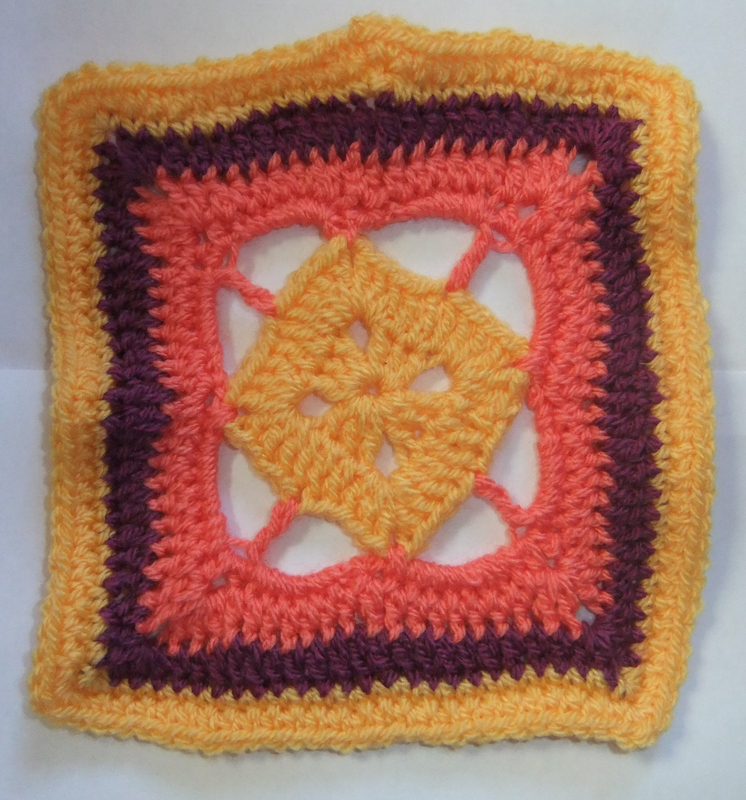 This square was quite similar to the pattern for the danish square I did on Day 3 however this pattern called for the use of htr, tr and dtr so lots of winding of yarn round the hook was required. I love the dahlia! I’ve not tried popcorn stitch yet, but I love the effect. Very pretty! It is very pretty I agree but tough on the hands. A blanket made of Dahlia squares would weigh a ton! Beautiful crochet, love your blog so much inspiration for me! I love your Dahlia square and I do agree with you about how heavy the blanket would be with all those popcorn stitches. Thanks for being an inspiration to others. Thank you for your kind words, I just love seeing what crafts everyone else is doing – that’s what inspires me. I LOVE your blog – thank you for introducing me to it! Love the granny stripe. Those blues are fab! Thank you, I could imagine a jumper made out of the same stripes. Thank you so much. I was so pleased that someone finds my work inspiring let alone put me in their top 5 beautiful blogs! 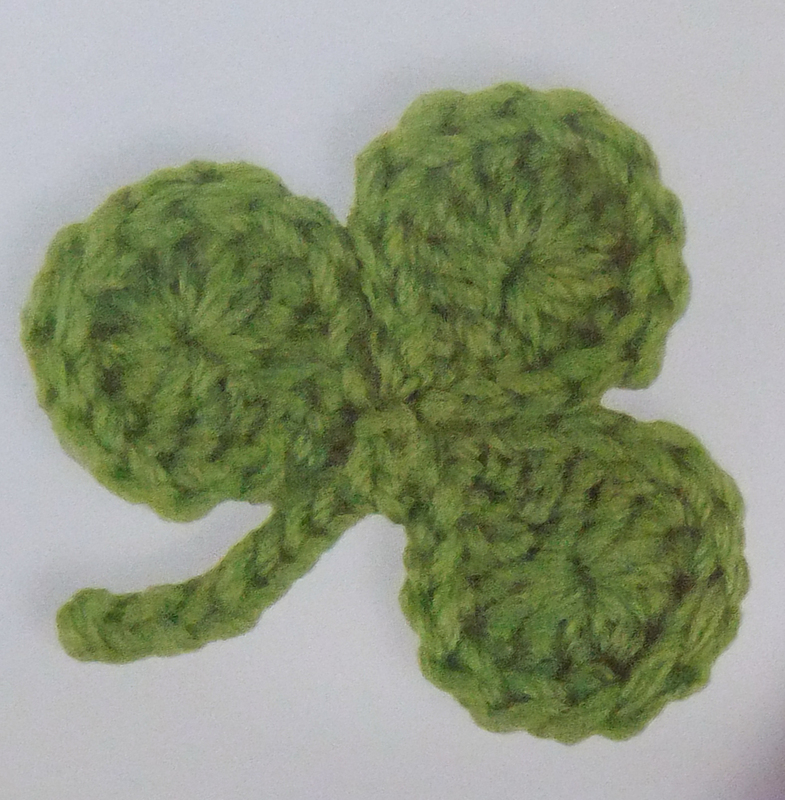 Oh, if only I’d known how to make those shamrocks before. My colleague from Northern Ireland would have been given some this week 🙂 They are lovely! It’s in a book ’100 flowers to knit and crochet’ – it contains so many patterns for various flowers, leaves, fruit and vegetables. I love the challenge that you gave to yourself to try different squares for each day of the month! What a great way to stay motivated! I’m throwing around the idea of making a blanket but it hasn’t quite taken hold in my mind. Your creative squares have inspired me to try something out! Where have you been getting the patterns for the different squares? 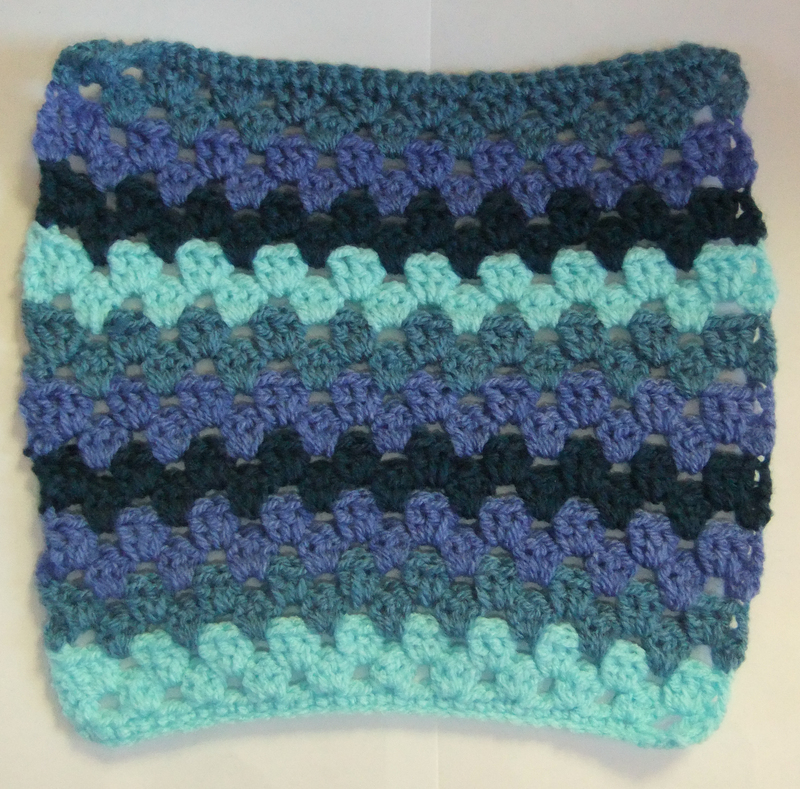 My squares have been taken from a book called ‘ 200 Crochet Blocks for blankets, throws and afghans’ by Jan Eaton. It’s such a fantastic book even just to flick through for inspiration. Thanks! I’ll have to check it out! Where did you get the pattern…or is it your own creation? It’s in a book ‘100 flowers to knit and crochet’ – it contains so many patterns for various flowers, leaves, fruit and vegetables. Jeannie, I’m with you, I can’t imagine making so many popcorn stitches in a row square after square…but yours came out beautifully and you did it! I just love seeing your new squares, and as I’ve said, I am looking forward to seeing what you’ll do with all of these beauties. Oh, the grounds look wonderful, and what a remarkable place for children to feel free among the enchanted looking trees and all that space to run and ‘fly’ around. Thank you for your kind words – it’s made my day! Love the shamrock! I tried to make one once but it didn’t work out very well – might have to check out that book you mentioned. The book is really good, I’d recommend it.